For inhabitants of the northern hemisphere, autumn features increasingly shorter days as we move inexorably toward the longest night of the year around December 21. 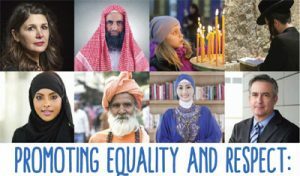 Interestingly, many cultures and faith traditions have long-standing traditions and stories that lift up light during this time of relative darkness. For Neo-Pagans/Wiccans and other indigenous peoples, it’s Winter Solstice, for Jews, Hanukkah, for the ancient Romans, Saturnalia, for Christians, Christmas, and for African-Americans, Kwanzaa, just to name a few. Statistics like that worry some Jews. In fact, the Conservative movement recently reasserted its ban on rabbis officiating intermarriages, even though interfaith families are welcome to worship at Conservative synagogues. 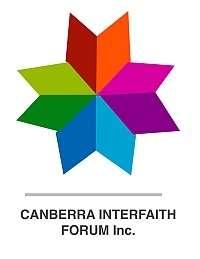 Publishers, however, recognising a clear market when they see one, continue to augment their interfaith collections, particularly for Jewish-Christian families. 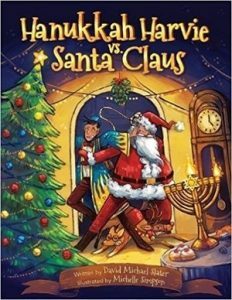 The latest book added to this mix is Hanukkah Harvie vs. Santa Claus: the Christmas Kerfuffle by David Michael Slater (author) and Michelle Simpson (illustrator) (Library Tales Publishing, 2017). Slater, a middle-school English teacher, has written more than 20 books, including the Forbidden Books series for tweens/teens, and Cheese Louise! and the Bored Book for younger children. In Hanukkah Harvie vs. Santa Claus – geared to kids 4-8 years of age – Slater takes a whimsical look at Christian-Jewish families dealing with the December holiday dilemma. Hanukkah Harvie, a super-hero character, uses his Hanukkopter to deliver Hanukkah presents to Jewish homes. One night, he runs right into Santa Claus delivering Christmas presents to Christian homes. Things quickly get out of hand as Hanukkah Harvie and Santa Claus try to out-gift one other. Eventually, they meet a little interfaith girl who identifies herself as an observer of Chrismukkah! From that day forward, Hanukkah Harvie and Santa Claus deliver their Chrismukkah presents together. 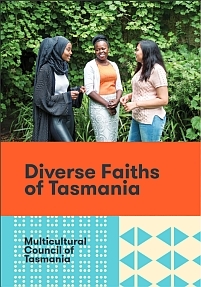 With rich, colourful illustrations and an amicable ending, this book honours both traditions without delving into any details about how interfaith families might do that themselves. Hanukkah Harvie vs. Santa Claus reminds me of two other whimsical, multicultural holiday tales that are good options for this time of the year. 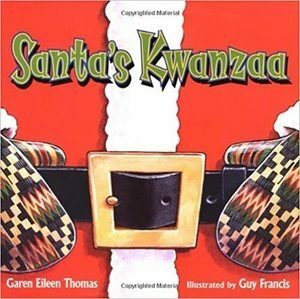 Santa’s Kwanzaa by Garen Eileen Thomas (author) and Guy Francis (illustrator), (Hyperion Books for Children, 2004). This book offers an imaginative take on how Santa and his family might celebrate Kwanzaa. Santa returns to the North Pole, tired after his Christmas deliveries, only to be reminded by his wife that it’s time for Kwanzaa! The elves/children, named after the seven principles of Kwanzaa, bring Santa presents. After celebrating for seven days, they all take a holiday sleigh ride. Frankly, the portrayal of an African American Santa and his family is reason enough to read this book to your kids. 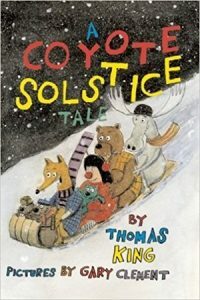 A Coyote Solstice by Thomas King (author) and Gary Clement (illustrator), (Groundwood Books, 2009). The famed First Nations scholar and author Thomas King takes a swipe at Christmas consumerism in this award-winning book. A little girl, dressed as a reindeer, shows up at Coyote’s house in the woods just as he and his animal friends are preparing for their winter celebration. They all end up at the nearby mall where Coyote gets caught up in the holiday frenzy until he realises that he must pay for the items in his cart. Together, they decide a seasonal feast in the woods is a better way to spend their time. Although this book doesn’t do much with the solstice theme (the word “solstice” isn’t even used in the text), it offers a nature-based alternative to the post-Thanksgiving spending whirlwind. December’s Gift: An Interfaith Holiday Story by Ashley Smith-Santos and Stasie Bitton (authors) and Sandra Salsbury (illustrator) (Stasie Bitton, 2015). 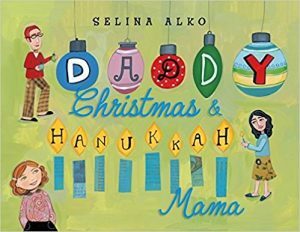 This book takes a similar approach, celebrating one holiday after the other as Clara visits her Jewish grandmother, followed by her Christian grandmother. It includes traditions for each holiday along with recipes for both latkes and sugar cookies. 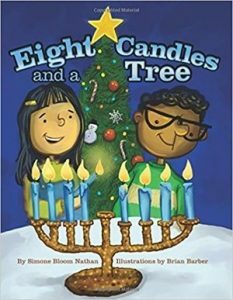 Eight Candles and a TreeText with emphasis by Simone Bloom Nathan (author) and Brian Barber (illus.) (Beaver’s Pond Press, 2014) is similar in tone but with an added twist.Sophie’s family is interfaith, but her neighbour, Tommy, is Christian. When Sophie’s family celebrates Hanukkah, she invites Tommy to join in. Then, when Sophie’s family celebrates Christmas, she and Tommy swap stories about their specific traditions. Tommy’s presence is an important addition, given that having neighbours of differing faiths is becoming increasingly common in the US. 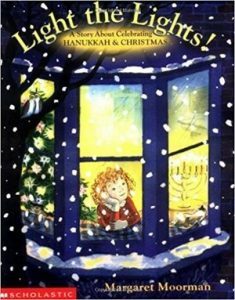 Nonna’s Hanukkah Surprise by Karen Fisman (author) and Martha Aviles (illus.) (Kar-Ben Publishing, 2015) is another book where the two holidays are intertwined. Rachel’s mother is Jewish and her father a Christian of Italian descent. Rachel and her parents visit the father’s family to celebrate Christmas, but also celebrate Hanukkah while they are there. The story itself is incredibly rich, with brief nods to both feminism and environmentalism. The tale includes a meal with both lasagna and latkes, a lost menorah where the candle-holders are nine Maccabee girls, and a “replacement” menorah where the candle-holders are Nonna’s upcycled perfume bottles. There are more serious books about the Winter Solstice and cluster of holy days that revolve around it. 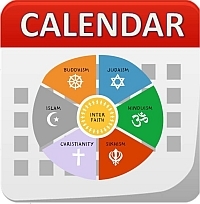 Although they are not explicitly interfaith, they are very informative when it comes to exploring the age-old importance of short days/long nights. 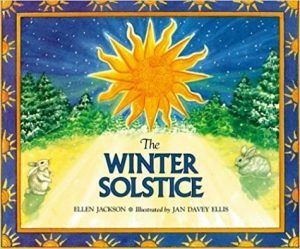 Written more than 20 years ago, one of my favourites for this time of the year is The Winter Solstice by Ellen Jackson (author) and Jan Davey Ellis (illus.) (Millbrook Press, 1994). This book reviews the various ways in which the December solstice has been honoured across time and place. 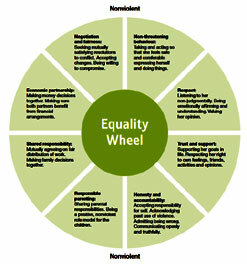 Scottish, Roman, Scandinavian, Peruvian, and Native American traditions are included. At the very end, Hanukkah and Christmas are also mentioned. 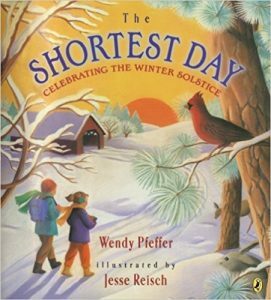 The Shortest Day: Celebrating the Winter Solstice by Wendy Pfeffer (author) and Jesse Reisch (illus.) (Dutton Children’s Books, 2003) is similar in tone and scope, with a bit more scientific fact thrown in. St. Lucia’s Day is discussed, and one illustration looks like Christmas, although it’s not explicitly mentioned. Hanukkah is not included. Lights of Winter: Winter Celebrations Around the World by Heather Conrad (author) and deforest Walker (illus.) 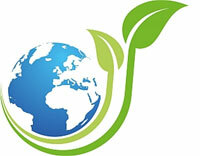 (Lightport Books, 2013) is the most recent version of the informative approach. This book contains information on 10 light-related holidays, including Yule, Saturnalia, Hanukkah, Christmas, Las Posadas, and Kwanzaa. As we move into this rich season of commemoration and remembrance, consider broadening your little one’s horizons by reading a few of these books. For centuries, cultures from around the world have honoured this time of darkness – which leads inevitably to a time of light and renewal. The narratives, ritual practices, and other traditions surrounding these transitions are incredibly rich. Kids’ books are a great way to engage in “teaching without preaching” – something many of us long for during this eventful, demanding, but hope-filled time of year. Vicki Michela Garlock is founder of Faith Seeker Kids and the Curriculum Specialist for Jubilee! Community Church in Asheville, North Carolina. 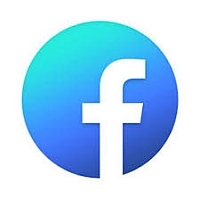 She has developed a Bible-based, interfaith Sunday School curriculum for kids from preschool to Grade 8 and regularly posts faith/interfaith-related blogs and comments on Twitter, @faithseekerkids. How did England’s Victorian Muslims celebrate Christmas?